Welcome to Women in Translation Month! While I may drift away from the plans I posted a couple of weeks back, my aim is the same – to review ten books by female writers that were originally published in a language other than English. Today sees the first of these reviews, but stick around to the very end to see my special feature for this month, the #WITMonth Bonus Shot. At the end of each post, I’ll be adding a few extra recommendations for those who like the sound of what I’m reviewing. Pasted in the window of Mr. Nakano’s store was a notice written in sloppy calligraphy: PART-TIME HELP WANTED, INTERVIEWS NOW. Although the sign said they were interviewing now, when I went inside to enquire, the shopkeeper told me, ‘Interviews start on the first of September at two in the afternoon. Punctuality is of the essence.’ With his beard and knitted hat, the trim shopkeeper made an odd impression. That had been my first encounter with Mr. Nakano. Having successfully applied for the position, she finds herself working in a kind of second-hand goods store, a shop where anything can turn up (as long as it’s not too expensive or high-class), and while she’s only looking for a way to earn some money, her time at the shop brings her so much more. The main cast of the novel are the four people connected to the shop. There’s the owner, Haruo Nakano, a bearded curiosity with an eye for women, and his elder sister, Masayo, an artist of sorts who likes to keep an eye on her brother’s affairs. Then there’s Hitomi, of course, who keeps to herself (and doesn’t reveal much about her background to the reader), which just leaves delivery driver Takeo – the obvious love interest (naturally), but with secrets he keeps close to his chest. Yet it would be unfair to simply see The Nakano Thrift Shop as another whimsical romantic comedy as Kawakami’s work is far more subtle than that. Her style is fascinating, with the chapters almost acting as independent stories, each separated by a distinct gap. The same is true inside the chapters with a rather oblique approach to the characters’ behaviour forcing the reader to read between the lines, with much left unsaid. Takeo is characterised more by his silences than his words, and many of the conversations the characters do have run in a slightly confused manner. What these episodes do is help us to put together a picture of the crew, piece by piece, and one way of seeing the shop is as a retreat for people seeking shelter from mainstream society. Mr. Nakano started the business after fleeing corporate life, and Takeo has ended up there after being forced to drop out of high school due to intense bullying. It may not come across quite as strongly for a reader with little knowledge of Japanese society, but there’s a definite sense of the shop as a haven for people unable to express themselves as they would like. Gradually, the four main characters develop strong ties and begin to act more like a family than a group of coworkers. As the story unfolds, Takeo’s personality is developed, revealing a shy young man with issues which will need to be addressed. Whether Hitomi will be patient enough to see the hard times through is doubtful, though. 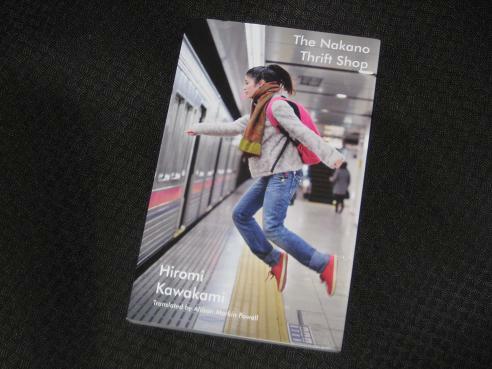 The Nakano Thrift Shop is a fairly light read at times, and if that sounds like your kind of thing, I have several suggestions. Quite apart from Kawakami’s other works in English (The Briefcase/Strange Weather in Tokyo and Manazuru), there’s Yoko Ogawa’s The Housekeeper and the Professor or virtually anything by Banana Yoshimoto (e.g. Kitchen, Goodbye Tsugumi, N.P.). Then again, you might prefer something a little darker… If so, Ogawa’s other works in English (The Diving Pool, Hotel Iris and Revenge) might be for you, and I’d also point you in the direction of Hitomi Kanehara’s Snakes & Earrings and Autofiction – two, short, dark, disturbing books. While I haven’t tried her work myself, Natsuo Kirino’s books might also appeal. That’s all for today – look out for more #WITMonth Bonus Shots in the weeks to come! Sounds like a lovely companion piece to Strange Weather. Glad to hear it’s another winner. Portobello have done a great job with the production of these books – love the covers. Yes, Japan isn’t bad for female writers, so my bonus shot section was fairly easy today (not always the case…). I remember reading Strange Weather in Tokyo and neither loving nor hating it – it was ‘okay’ – if you say this isn’t as accomplished it’s probably not for me.